When your Atlanta home or business is in need of hardwood floor refinishing, you want to ensure you get the job done right. After all, refinishing is an investment, and your floors are an essential part of what makes your home or business beautiful and functional. It’s okay to be picky about the team you hire for the hardwood floor refinishing job! At Atlanta Floors, we understand the importance of getting the job done right. We are proud to offer premier hardwood floor refinishing services for residential properties and commercial spaces in Atlanta,, Georgia, and the surrounding suburbs. 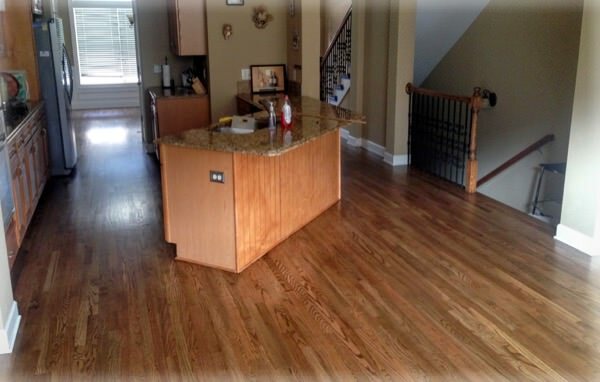 Our expert team includes the top wood floor refinishers in the greater Atlanta area. Residential hardwood floor refinishing for homes, townhomes or condos. Commercial hardwood floor refinishing for business offices, retail stores, bars, churches, and basketball courts. Refinishing for all solid wood floor species, some engineered wood floors, and stairs. Refinishing for different wood finishes and stains, including oil-based or waterborne. Dustless floor refinishing for customers who desire a quicker, cleaner, more affordable alternative to a full-blown hardwood floor refinishing. Just like any home improvement project, you can acquire basic services that just barely get the job done, or you can hire the best of the best professionals who are fully committed to the task. At Atlanta Floors, you can be sure you will have a team working for you that cares about hardwood floors and is passionate about making them as beautiful and functional as they can be. Whether you want to discuss a traditional hardwood floor refinishing project for your home or business, or would like to learn more about dustless floor refinishing, we are here to help. Call today to speak to one of our expert Atlanta Floors team members, or contact us online.